Do your kids fight? Yeah, I know. Mine don’t either. Especially in the car. I calculated how much time I’ve spent in the van this last year just picking the kids up from two different schools (an hour wait time between schools) and taking them to their lessons. I’m not good with numbers, but I think the total was in the millions. We spend a lot of time in that box. My kids are good kids. They love each other. They help each other. They do secret acts of kindness for each other. But when it is time to get in the van they turn into flesh-eating piranhas. It is as if some seats in the van are made of solid gold and other seats are barbed wire. The back seat, especially. You would think by listening to the cries of distress and agony as they make their way to the back that they are on their way to the electric chair. And my children, none of them being shrinking violets, will defend their right to sit in their desired seat with volcanic passion. So yes, I admit it. We are car fighters. Thank you in advance for all the advice you are going to give me in response to this post. I welcome it with open arms. But I want to assure you that trying to stop the fighting is a short road to insanity. Imagine being strapped into a box for an unknown amount of time with nothing to do and no power to escape. Meanwhile the person next to you is poking you in the eye or yelling in your ear or trying to steal your food. I think in the adult world we would call this “a hostage situation.” It should be no surprise that children don’t like it, either. We have moments of happiness. We do. I think there was a time a couple weeks ago that we laughed. Seriously, though, most of the time the kids find plenty to do. We listen to books on cd, we sing with granola bar microphones, and we play quiz games. I bring snacks, they draw, they write stories, and there is always a lot of reading going on (for those who can). 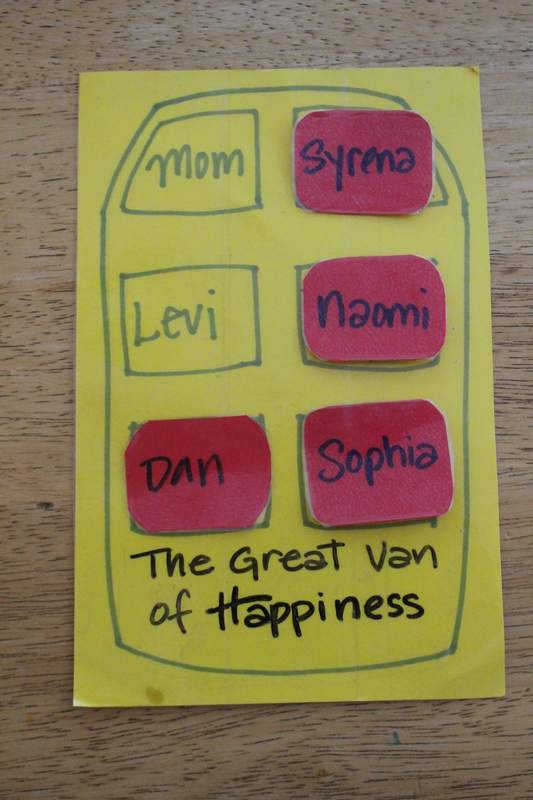 We’ve used The Great Van of Happiness for about a year now with mixed results. Here is my brief report. But we still use it because it is the best thing we’ve got. It is flawed, because everyone has to rotate to the back seat but not everyone gets to rotate to the very front “favorite child” seat because some are too young. Fireworks also come out when people forget to check the Great Van of Happiness chart before they sit in their seats and then there is a great bottleneck of kids in the doorway of the van, some sitting, some half-standing and all of them snapping at each other. Once a week we pick up a little neighbor friend from middle school and bring her home. I try to reserve shotgun for her, not only because she is our guest, but also to give her some distance from the rest of the wolves, that her life might be spared. (She is an only child.) Sometimes, when she is sitting next to me and the battle is raging behind us she asks me in a very grown-up tone if I am going to do anything about it. Being that she is an outsider, I am always interested in any input. “Well, do you have any good ideas?” I ask her, very sincerely. “Of course not. You don’t need to ask.” After all, when they are not torturing each other that is what Dyrengs do best. (Those over five years old, anyway.) I was assuming she was just going to read to herself. But she had no intention of doing that. She opened up a book and cleared her throat. “Chapter One,” she announced loudly. Everyone went quiet. You could have heard a Cheerio drop. It was as if someone had suddenly stuffed peanut butter in everyone’s mouth. And miraculously everyone stayed quiet the entire way home. Peace. Tranquility. Hope for the future. Once we arrived home I tried to refrain from kissing her little red head. When we picked her up the next week she again read to everyone, plunging the van into another deep, meditative silence. The book was not particularly interesting (in fact it was a book on how to play video games, something that seems very odd to me) but there was something about the loud, constant cadence of her voice that mesmerized everyone. I had to keep checking everyone in my rear view mirror to make sure they weren’t in comas. Who knew that adding a sixth child to the mix would calm things down? Unfortunately school is now finished, and the Great Van of Happiness will have to do with out our neighbor until next year. Or perhaps her mother will let us adopt her for the summer. Or I could pay her. 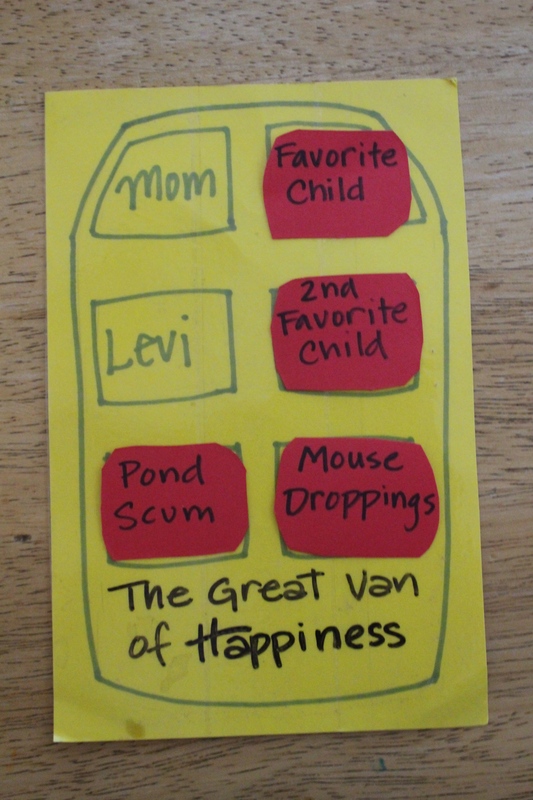 In the meantime there is not much I can do except keep reminding my kids that they are all important no matter what seat they have to sit in, and that no one in the Great Van of Happiness is mouse droppings. Sometimes we just have to bloom where we are planted. Even if it is in the very back seat. That was an awesome read – so true of real life! Mouse droppings… Pond scum… I’m dying! I am so glad you blog. I am so glad you can see the humor in all the chaos that rages around us. i can’t relate at all. Our 8 children never fight in the van:). Seriously, things got a lot better when we bought a 15 passenger van. 4 rows, that means no one has to sit within 2 feet of anyone else. It also helps that most of them are so far back that we can’t hear them unless they yell. Seriously I loved your post and I can totally relate. I was laughing the whole way through. Hmmm…a 15 passenger van. I like the sound of that. Thanks for your comment, Mike. I am glad you enjoyed the post. This is great – My kids are all still too young (4.5, 3 & 20 mo) to fight over seating arrangements as all 3 are still in car seats of some kind and will be even when #4 joins us in a few months. This just means that at some time in the future (closer than I realize) we will be faced with the same problem. Hopefully I’ll be able to remember reading this when the time comes! Thanks for sharing! Thanks for sharing and making me laugh. One of the longest running debates among my six children was if calling shotgun was sufficient or if the front seat was “first come, first served”. When things got rough I made them all sit in the back. That is a great idea, Stacey! 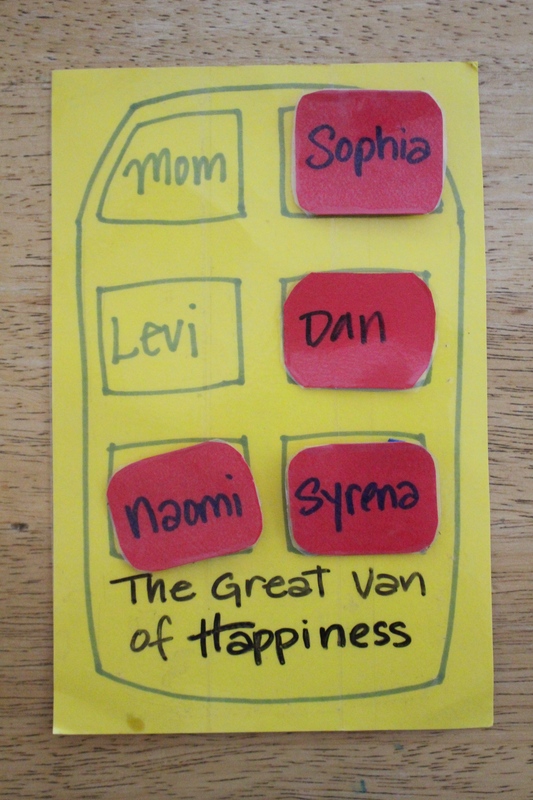 Love your Great Van of Happiness! How I finally solved this was to always let the oldest sit in the front (or the oldest in the car) My reasoning is they were the closest to driving and needed to pay attention to the road etc. I started pointing out driving regulations to them etc. Wasn’t perfect but it stopped the arguing. I told them it was fair because once that person was driving etc the next one got to sit in the front.